DESCRIPTION: Shell large, spherical, with numerous sub circular to polygonal small pores and 10-17 large polygonal pores of 1/4-1/2 length of the shell diameter. 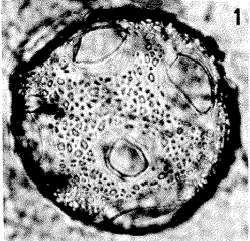 Number of the small and large pores are ca. 30-40 and 2-4 respectively on the half meridian. The large pores form very short tubules. DIMENSIONS: Shell diameter: 175-220 µm (6 specimens); large pore diameter: 12-64 µm (6 specimens). TYPE LOCALITY: 15°21.1'N, 151°28.5'W; sediment trap at 378 m; collected during July-November, 1978. REMARKS: This species has a relatively large shell for Collosphaeridae, and differs from Siphonosphaera sp.A (Plate 4, figure 2) in shell size and in number and shape of small and large pores. DERIVATION OF NAME: The name of this species is the Latin meaning having the nature of a large sphere.